Served warm from the stove with golden raisins mixed in, wheat berry pudding is a fantastic way to start the day. Served at room temp as dessert, appetizer or even lunch with your favorite fruits and nuts mixed in this dish is simple to make and so versatile you’ll never get bored of it, I promise! 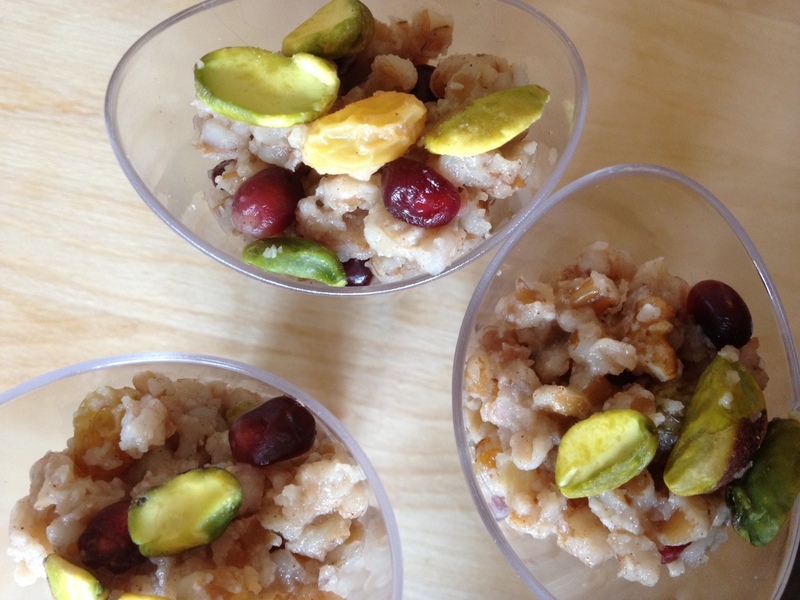 Named for Saint Barbara (Varvara), this traditional wheat pudding is prepared on the night before the saint’s feast day (Dec. 4/17) with a special prayer for the health and well being of children. It also goes by the name kolyvozoumi but I’ve found that kolyvozoumi recipes often include tahini which this recipe does not. And as I mentioned already, you can it enjoy this yummy dish all year round. I like to use parboiled wheat berries as I don’t always have the time to soak overnight. 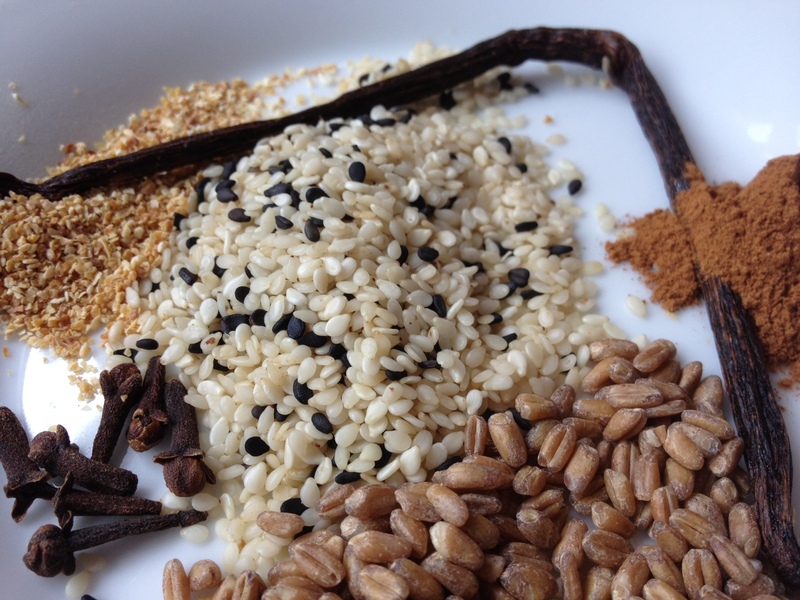 Just follow the instructions for preparing your wheat berries before cooking if you want to go with plain dried. If you have trouble finding them near you, order online here – these are my favorite. New to wheat berries? They’re delicious and, always a bonus, really good for you too. Whole grain kernels chock full of iron, protein and of course fiber. The wheat berries cook like rice or barley and plump up when ready to eat. They soak up the flavors you cook them with like little yummy sponges. They’re slightly sweet, delicate and just a little chewy. For this recipe, cook on the stove top in a 3qt or larger pot. For the first 30 minutes or so of cooking time, this dish is pretty independent and you can be doing other things in the kitchen or elsewhere. The last ten minutes, though, you’ll need to be right on top of it. Stirring the dish is extremely important in these last few minutes and will pay off with the creamiest results! In 3 qt. saucepan, add wheat berries and water. Bring to a boil. Add vanilla bean and cloves wrapped in piece of cheesecloth or reusable tea bag so you can easily remove then later. Turn down the heat and cook uncovered on very low simmer for about 30-35 minutes until wheat is tender and chewy. Once the wheat is cooked, remove the vanilla bean/cloves and add the honey, sugar and cinnamon. Stir well. Mix the almond flour with equal parts water and stir into wheat. Increase heat, bringing wheat up to a slow boil. Stir constantly for the next 6-8 minutes until almost all the cooking liquid has been absorbed. If you’d like, you can mix in 1 tbsp of all purpose flour if you feel there is still too much liquid left. Cook for another 2 minutes, stirring constantly and remove from the heat. Serve hot immediately for breakfast or allow to cool to use later. 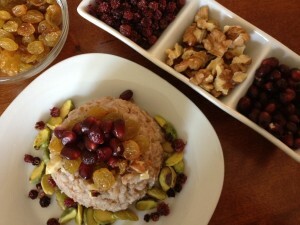 Mix in your favorite fruits and nuts and you’ve got a lovely dessert or appetizer. I like to mold the wheat berry pudding into a teacup as I first saw it in Chios and pictured above. It’s also always a big hit for entertaining so feel free to experiment with your presentation! 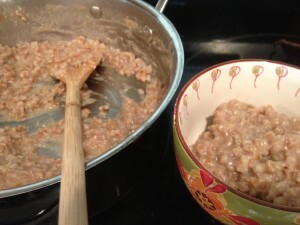 Thanks so much for sharing your fabulous “Greek oatmeal” recipe! I made it tonight, thinking it’d be a nice dessert dish, but instead it turned into the main course, I couldn’t hold back from polishing off half the pot with some banana and blueberries thrown in, it was so delicious! I’m proud of myself for leaving enough for tomorrow’s breakfast, ahaha. The spices really worked for me (vanilla and cloves, mmm!) as well as the texture, chewy perfection, thanks to the wheat berries. Made some minor changes though, since I soaked my berries overnight and simmered them for about 80 minutes, seemed to do the trick, as well as left out the honey and cut down on the sugar (used 1 tsp coco-palm instead, not much of a sweet-tooth, :D).